Prehistoric granite boulders and tranquil Australian bush landscape. Enjoying nature is one idea of what to do in Stanthorpe and the Granite Belt. At Alure Stanthorpe, rolling pasture is surrounded by prehistoric granite boulders and a tranquil Australian bush landscape. This is high country with big open skies. Stunning scenery and the smell of fresh air are guaranteed. A profusion of bird and wildlife are on the doorstep of our villas and tent that exude ‘Bush Luxury’. On most mornings you will see kangaroos grazing from the comfort of your palatial king-sized bed. Below are our biological offerings. We invite you to roam the property and experience our serene nature. This is a place to slow down, catch your breath and reconnect with nature. Alure Stanthorpe is located on a 50-acre property of predominantly bushland and pasture in the Granite Belt, just south of Stanthorpe. The Granite Belt owes its name to a belt of igneous granite rock that runs through the region. Once the site of active underground volcanos, thousands of years and the elements have left a remarkable ancient landscape of hardened molten magma granite outcrops that protrude from Alure’s hillside like massive globules. Our bushland hosts an immense variety of wildlife. Species that you might encounter include the Eastern Grey Kangaroo, Common Wallaroo, Red-necked Wallaby and Swamp Wallaby who often graze at sunset in front of the villas. Other species you may also view include a variety of reptiles, koalas, echidnas, turtles and the elusive Spotted-tail quoll. Echidnas are often out and about in the early hours of the morning or seen fossicking in the late afternoon. Spring/summer is the best time to spot turtles as they migrate in search of a new waterway to call home. A large variety of birds have been identified at Alure. This provides an ideal opportunity for those wishing to combine their stay with the favoured pastime of birdwatching. The diversity of birdlife varies depending on seasonal changes, the availability of food sources and migratory patterns. However, sightings include Wedge-tailed eagle, Black-shouldered Kite, Crimson Rosella, Eastern Rosella, Spotted Pardalotte, Superb Fairy-wren, Double Barred FinchBrown Quail, Red-rumped Parrot, Little Corella, Dusky Moorhen, Little Pied Cormorant, Yellow Tailed Black Cockatoo, Sacred Kingfisher, Honeyeater, Australian King Parrot, and various ducks and owls. Our friendly kookaburras, doves and magpies will also greet you during most times of the year. Spring is the best time of year to sight bird life as they congregate in significant numbers. Alure is a mixture of pasture and remnant eucalypt woodland. The native vegetation of eucalypt woodland or low forest is home to many rare floral and faunal communities. Predominant species include the Wallangarra White Gum, Granite Silver Wattle, Broad Leafed Hickory Wattle, Black Cyprus Pine, Stringy Bark, Bottlebrushes, Rough Barked Apple and Kurrajong. In spring our flora come alive; wildflowers including rare orchids and Tufted Bluebell bloom, the eucalyptus are flowering and roadsides abound with striking yellow Coreopsis. Minimising our impact on the environment, Alure’s objective is to provide a unique and authentic Australian bush experience that is both ecologically and financially sustainable. Over the years, we have worked continuously to improve our efforts at sustainability and this now extends to purchasing policies where possible, sourcing local products and services and using energy efficient operation methods. Beyond the property, the Granite Belt and Southern Downs region is a place of breathtaking natural contrasts; from world-heritage listed Gondwana rainforest to captivating, prehistoric granite rock formations that precariously balance amongst the stunning eucalyptus forest. Winding tranquil creeks flow into the tumbling waters of the Killarney’s Queen Mary Falls. Rich volcanic farm-land dotted with sunflowers abruptly changes to the vine loving granite terroir that explodes with gourmet produce and award winning wines, creating Queensland’s premier wine region. Spectacular and diverse, the region is blessed with three national parks – Girraween, Sundown and Main Range (Queen Mary Falls), and another three are within an hour’s drive; Bald Rock, Boonoo Boonoo, and Basket Swamp. We invite you to not just see them, but experience them. Because our natural wonders aren’t just for taking pictures of – to truly say you’ve seen our natural wonders you have to get out of the car, hike down from the scenic vista and feel them beneath your feet. This is our TOP 4 list – why don’t you create your own? Instagram us #alurestanthorpe with your favourite natural wonder in the region! Girraween (an Aboriginal word meaning place of flowers) is located just minutes from Alure, off the New England Highway, 25km south of Stanthorpe. The park is a paradise for bushwalkers and explorers with scenic walks, wildlife viewing, and picnic areas. Scale the enormous prehistoric granite and precariously balancing boulders that lie between clear streams. Nearly 20kms of walking tracks, ranging from 20 minutes to six-hour hikes, wind their way throughout the park and lead to impressive granite features including The Pyramid, The Sphinx, Turtle Rock, Castle Rock, Dr Robert’s Waterhole, Underground Creek and Mt Norman. Climb to the top of the great Pyramid and see the iconic Phoenix monolith or experience the elevated feeling of 360-degree views at Castle Rock. 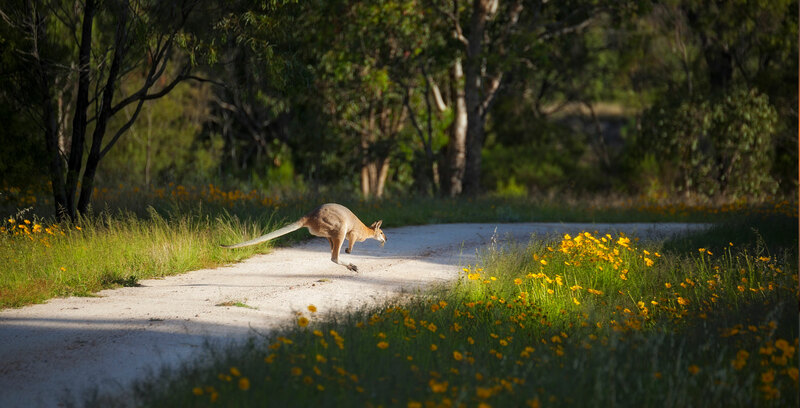 Girraween is also home to iconic Australian animals including the platypus, echidnas, kangaroos, koalas and even wombats, plus 700 or so plant species. From brilliant red gorges and excellent 4wdriving adventures, the great untamed Sundown National Park is perfect for the adventurous and offers tracks that will test even the most experienced driver. Are you up for it? Don’t fear, there are more sedate options available too. On foot you can explore the impressive Red Rock Falls, Mt Lofty and Red Rock Gorge. The Severn River and remains of pastoral/mining heritage can be discovered via walking tracks, challenging remote walks or the 4wdriving track. More than 150 species of birds have been recorded in the park, making it the perfect location for bird watching enthusiasts. Rugged mountain ranges, spectacular lookouts and rare wildlife feature in this prestigious Gondwana Rainforests of Australia World Heritage Area Park. Main Range covers 30,170.5 ha and was formed from a shield volcano eruption approximately 22 million years ago. It includes the largest area of rainforest in South East Queensland and is part of the Scenic Rim Important Bird Area, identified as such by BirdLife International because of its importance in the conservation of several species of threatened birds. The park extends from Kangaroo Mountain south to Wilsons Peak on the New South Wales border and includes Mount Superbus (1375 m), South East Queensland’s highest peak. In total, there are more than 40 peaks in the park higher than 1000 m. There are extensive walking tracks and picnic facilities centred on Spicers Gap, Cunninghams Gap and Queen Mary Falls.A variety of vegetation types occurs in the park. Rainforest grows in moist or sheltered locations, with open eucalypt forest occurring on the drier ridges and valleys. These diverse habitats shelter much wildlife, including the seldom seen Albert&#39;s lyrebird, the endangered eastern bristlebird and the vulnerable black-breasted button-quail. An impressive trio of falls can be found at the southern end of the Main Range National Park. The beautiful Queen Mary Falls display a sheer 40m drop of spring water flowing all year round. On the way visit Browns Falls and Daggs Falls. Goomburra is one of four visitor nodes of Main Range National Park. Rugged mountain ranges, spectacular lookouts, waterfalls, trickling streams and rare wildlife make this a very special place. Several longer walks can also be chosen, including along an old forestry snigging trail. We admit this one is not officially in our region – but it’s right on the border so we suggest you don’t miss it. Seen Uluru and Mt Augustus, now discover the largest exposed granite rock formation in the southern hemisphere, and the fourth largest monolith in Australia. Bald Rock, located in Bald Rock National Park (NSW) and adjoining Girraween National Park, rises to 1277m above sea level and towers about 200m above the surrounding bushland. The awesome granite dome, 750m long and 500m wide, is water streaked, creating a striking view on any day. From the top you are rewarded with sweeping views of the region and beyond. We would be happy to help you organise a day trip through the region’s natural wonders. Not surprisingly, with such amazing scenery all around us, bush walking is hugely popular. Information on the best walks in the area and reference guide books is available from reception. You will need good walking boots, hat, sunglasses, sunscreen, camera, waterproof jacket and clothing appropriate to the various weather conditions. We would also be happy to provide you with a Gourmet Picnic Hamper for along the way. You can also hire bikes from Granite Belt Bicylcle Tours & Hire. For a more relaxed approach walk or cycle along Stanthorpe’s Quart Pot Creek that unwinds amid deciduous gardens and picnic areas. Climb or drive up Mount Marley for commanding views of the town.